WASHINGTON, December 2, 2014 — Development policies based on new insights into how people actually think and make decisions will help governments and civil society achieve development goals more effectively. A richer and more accurate understanding of human behavior can make it easier to tackle such difficult development challenges as increasing productivity, breaking the cycle of poverty from one generation to the next, and acting on climate change, finds a new World Bank report. 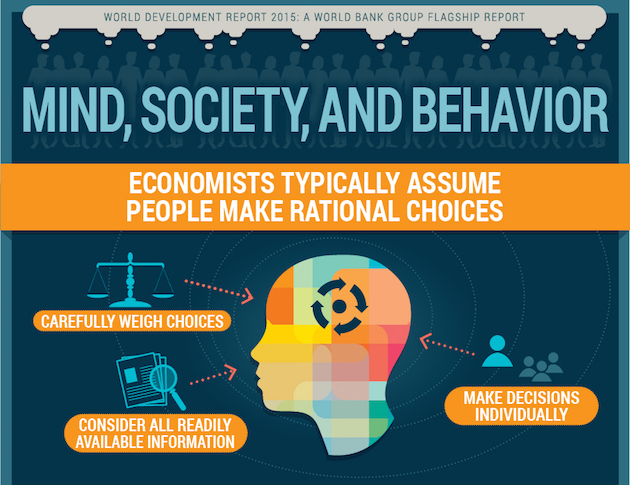 World Development Report 2015: Mind, Society, and Behavior examines early, exciting work that suggests ways of diagnosing and solving the psychological and social factors that influence development. The new approaches are complements to a host of other standard economic tools. People do not always make deliberative, independent decisions based on careful self-interested calculations, the report finds. Rather, they tend to think quickly and to use mental shortcuts and shared mindsets. By factoring this in, governments and other actors can design programs that make it easier for individuals to cooperate in the pursuit of shared goals. To inspire a fresh look at how development work is done, the report outlines three principles of human decision making: thinking automatically, thinking socially, and thinking with mental models. Much of human thinking is automatic and depends on whatever comes to mind most effortlessly. All people are deeply social and many will cooperate as long as others do too, and they are influenced by social networks and norms. Finally, most people do not invent new concepts; rather they use mental models drawn from their societies and shared histories to interpret their experiences. Interventions need to take account of these insights and be designed through a ‘learning by doing’ approach. The factors and mindsets affecting decisions are local and contextual. It is hard to predict in advance which aspects of program design and implementation will drive the choices people will make. The report applies the three principles to multiple areas, including early childhood development, productivity, household finance, health and health care, and climate change. The report stresses that focusing more closely on correctly defining and diagnosing problems can lead to better designed interventions. Since even experts’ initial assumptions about the causes of behavior can be wrong, the implementation period should test several interventions, each based on different assumptions about choice and behavior. After adoption, the interventions’ effects should inform new rounds of definition, diagnosis, design, implementation, and testing. The process of refinement should continue as interventions are scaled up.